Egyptian texts refer to Re and Osiris as the Twin Souls. Etymologically, the relationship between Re/Ra and Osiris becomes self evident. The Egyptian word for Osiris is Aus-Ra. The word Aus means the power of, or the root of. 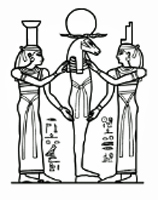 As such, the name Ausar consists of two parts: Aus-Ra, meaning the power of Ra, meaning the re-birth of Ra. The perpetual cycle of existence—the cycle of life and death—is symbolized by Ra (Re) and Ausar (Osiris). 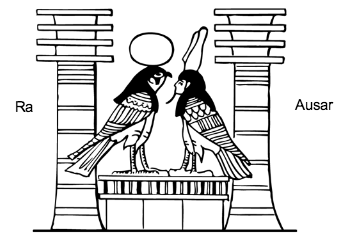 Ra is the living neter who descends into death to become Ausar, the neter of the dead. 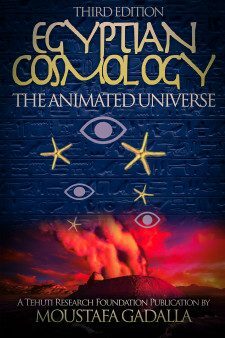 Ausar ascends and comes to life again as Ra. The creation is continuous: it is a flow of life progressing towards death. But out of death, a new Ra is to be born, sprouting new life. Ra is the cosmic principle of energy that moves toward death, and Ausar represents the process of rebirth. Thus, the terms of life and death become interchangeable: life means slow dying, and death means resurrection to new life. The dead person in death is identified with Ausar, but he will come to life again and will be identified with Ra. I am His Two Souls in his Twins. I am yesterday, I know the morrow. What is this?—Ausar is yesterday, Ra is tomorrow? This is Ra who comes to rest in Ausar. This is Ausar who comes to rest in Ra. The Litany of Re is basically a detailed amplification of a short passage of Chapter 17 of The Book of the Coming Forth by Light, describing the merging of Ausar and Ra into a Twin Soul.